I served this dish with some roasted lamb for a Sunday roast with a twist but I think it would go well with duck or chicken too. You could add some coriander and chilli flakes to serve it with an Asian dish or with some white fish or salmon. 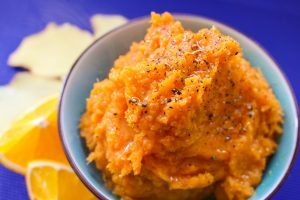 I haven’t included quantities for this recipe as it is very straightforward so you can make as much as you like and add as much ginger, nutmeg and orange zest as you wish according to your personal preference. Peel and dice equal amounts of carrot and sweet potato (the vegetables should be roughly the same size). Place them in a pan of boiling salted water with a slice or two of ginger and cook until tender. Drain the vegetables then remove the ginger and add a tiny amount of nutmeg and some olive oil/butter or ghee (whichever you prefer or have to hand, I used ghee). Using a potato masher, mash the vegetables until you have a fairly smooth mash or purée consistency. Check the seasoning then add a tiny bit of orange zest, just a little bit at a time as you don’t want it to overpower the dish. Check your seasoning and then serve.